A stately Victorian presence on North Broad Street, the Pennsylvania Academy of the Fine Arts (PAFA) is arguably the finest work from Frank Furness, whose work in Philadelphia also includes the library of the University of Pennsylvania. 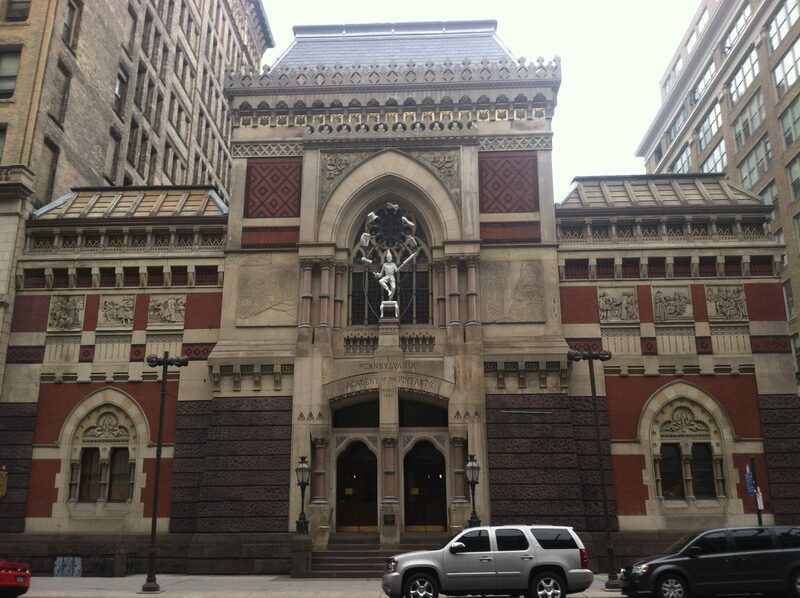 This historic building is the home of the museum of PAFA, which is still a major art school. The building is a major highlight, because its greatness doesn’t end at the facade. True to its Furness design, it follows an unusual brick pattern along the alley that becomes Cherry Street. The interior features the main foyer, which has the stained glass window that is very prominent on the facade. It has an unusual decor, but one that is quite oddly satisfying. The museum itself is dedicated to American art, mostly from colonial times and the early 19th century. The foyer of the Furness building contains one of Gilbert Stuart’s portraits of George Washington, as well as busts of Franklin and Lafayette on either side of the stained glass window. A portrait gallery has portraits of everyday Philadelphians in the late 1700s. One particular work Artists featured in this building include Benjamin Rush, Gilbert Stuart, Charles Wilson Peale, and Thomas Eakins, who taught at PAFA. One particular work is The Fox Hunt, which is widely considered Winslow Homer’s finest work. It’s not a very large collection, but the quality of the artwork makes up for it. The interior rooms also show Furness’ style, with their bright red features and unique columns. Across Cherry Street is the Samuel M.V Hamilton Building, which displays student work and rotating exhibits of contemporary art. The art inside this building is always changing, and frequently shows work from students in the previous year. There are galleries on the first two floors of this building, including a sculpture gallery on the second floor facing Broad Street, which provides nice views. The art in this building includes paintings, sculptures, and videos, which have been used in modern art. Admission is $15 for adults, $12 for students and seniors, $8 for youth (13-18), and free for military, children, and PAFA students and alumni. General admission includes both buildings. Students of various Philadelphia-area colleges, including UArts, Penn, Temple, St Joe’s, Jefferson, and others, get free admission.